In today’s business environment, operating at optimal efficiency is paramount. Using All Star Software Systems’ business process automation solutions allow organizations to automate business processes, reduce costs and create competitive advantage over their peers. Processes that used to take hours or even weeks to complete will be reduced to minutes. The powerful capture, data transformation, content management and workflow technology implemented by All Star has allowed our extensive list of clients (Enterprise and SMB) to achieve significantly positive results in many departments and many vertical markets. 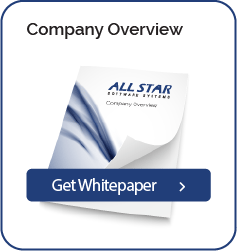 All Star has used this technology to implement solutions like AP Invoice processing, Expense Report processing, Sales Order processing, Remittance processing, Document Delivery, Claims processing, New Account processing, Underwriting processing, Credit Memo processing, HR Onboarding, HR Employee Files and Student Transcripts.